That sounds great, but what does it mean, exactly? We obviously love technology, it’s why we’re in this field and why we do what we do. The reality is, we’ve found that what we really love, is always learning new things. That’s why this industry is so fascinating: it changes, constantly. Our clients love us because our drive and desire to be constantly learning holds true in our relationships. We love learning about you: what you do, what drives you, and about your business needs. But that’s not enough. It’s not enough to just be curious and enjoy learning new things. That is where passion comes in. Our passion for technology drives us to find the best solutions. Our passion for you, and the success of your business, drives us to deliver the best solutions and services we can. We’ll get an engineer working on your issue as soon as possible, typically within an hour. Resolving issues is unpredictable, but once it’s in our hands, you can focus on what you do best in your business. Our Service Manager monitors all support requests to ensure nothing is lost or overlooked. They also make sure that you’re kept in the loop as your issue is being resolved. We’re big on collaboration. Each and every engineer’s main goal is to ensure you get the best – and quickest – resolution to your problem. We accomplish this by collaborating internally and with our vast network of partners. This ensures we’re able to provide cost-effective solutions to any IT issues that arise. With our monitoring system, typically we’re able to prevent big issues from occurring in the first place. Which software should I go with? What is my budget, and what is a reasonable budget? Is this software or hardware compatible with my network? Should I go with the latest and greatest or stick with tried and true? Will my users need training, who’s going to do that? How will I make sure my project is completed on time, and on budget? These are tough questions that we’re really good at answering. We start every project with a thorough needs analysis. That’s a fancy way of saying, we dig deep into understanding your business, the problems you’re trying to solve, and the broader impact this project may have. Next we’ll help you find the right solution. Looking for technical solutions can be very challenging, especially when you don’t really understand the technical ramifications of what you’re looking at. We can take this burden off your plate and help you make wise choices. Once we all know what we’re going to do, and why, we’ll follow through and implement your project. We’ll handle scheduling, coordination and communications. We’ll get all the hardware or software installed or upgraded, create hand-outs for your users, and even provide training if needed. During most projects, we’ll also conduct a pilot phase. During this time, we’ll learn the solution with you (if we don’t already know it) and help guide you in making decisions about how the solution is configured to maximize your businesses efficiency and truly get the most out of your investment. All projects are done with clean, professional, white-glove service so that when we’re done, you’ll have a solution you can be proud of. 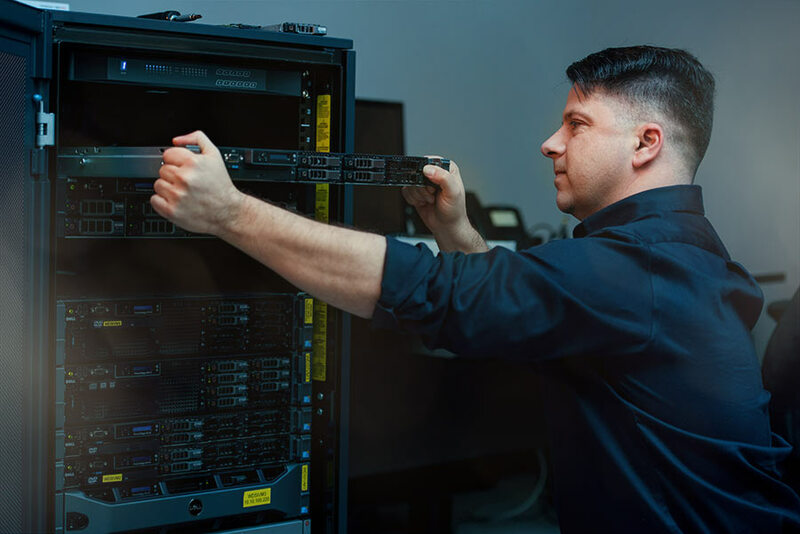 We have skilled, experienced engineers who can assist with everything from the monitor you’re reading this on to the Internet connection that delivered this page to your Desktop. What we mean is, most IT vendors will install a PC or install a program on your computer, accept all the defaults, and call it a day. From our perspective, the job has only begun after the computer or software has been installed. People need training and guidance on the computers and programs they’re using to make sure they’re getting as much out of their investment as they can. We are 100% focused on making sure that you have the best technology and are using it to its maximum potential. Many IT vendors will claim that they’re the best, but all too often they’re just like everyone else. We also take the time to remove the bloat from computers, which often comes installed by default. We want to make sure that your computing experience, every day, is efficient, productive and convenient. That is why we focus all our energy into providing IT solutions that runwell.